I've seen the various posts about the software architecture and indeed the db hardware is documented too. I've also seen a reference to HAProxy as the load balancing software. What does HAProxy run on though? It appears to be running on a Linux box; is this correct? Or have some other Linux-based balancing appliance now been installed? 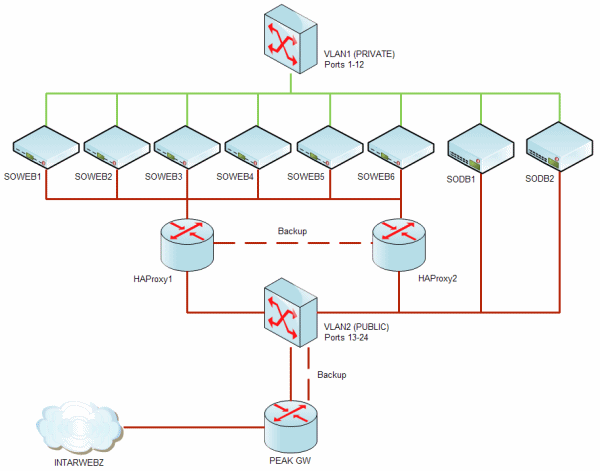 Check out the Stack Overflow Network Configuration blog entry. Jeff talks a lot about how they are using HAProxy. The HAProxy box is indeed linux. I'm not sure if it is still a virtualized instance, but it used to be. I assume that, since they now have redundant HAProxy boxes that there is at least one physical box doing load balancing. Are meta and stack-overflow hosted on different machines?